Caretaker boss Dean Austin admits he has been left feeling ‘sad’ and ‘angry’ that the Cobblers have suffered relegation from Sky Bet League One. And the 48-year-old, who is holding his hands up for the part he has played in the club’s demise this season, says he believes Town ‘are a lot, lot better’ than they have shown. The Cobblers were effectively relegated last weekend when they lost 1-0 at Walsall, a result that, coupled with Oldham’s draw with Doncaster on the same afternoon, means they need the small matter of a 9-0 win against the Latics in the final game of the season this weekend to give themselves a chance of avoiding the drop. That being the case, the club is preparing for life in league two, something which Austin believes should never have happened with the players the Cobblers have at their disposal. “I feel partly responsible for the situation we find ourselves in, because at the end of the day I was the assistant manager for the previous eight months,” said Austin, who has been in charge of the first team since the sacking of Jimmy Floyd Hasselbaink a month ago. “I wasn’t the person that made the decisions, I wasn’t the person who picked the team and I wasn’t the person who made the signings, but that doesn’t mean I don’t feel responsible, because I do. “That makes me sad, and makes me quite angry because I think there is a lot more in this group, and this group is a lot better than where it is going to finish up ahead of next season. “I don’t think we should be in the position we are in with the players we have here, that’s my opinion. “But these things happen, and you have to take it on the chin. 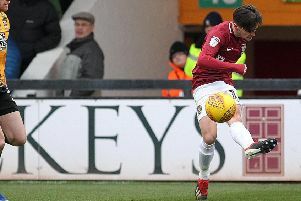 The Cobblers wrap up their league one season this weekend when they host Oldham, who travel to Sixfields needing a win to ensure they avoid relegation. And although Austin knows his side have little to play for in terms of league position, he is demanding a the players perform as if they desperately need the three points . “I am a great believer, whether I am here or I am not here, the momentum that you leave a season is what you take into the following season,” said Austin, who will sit down with chairman Kelvin Thomas after this weekend to discuss his future at the club. “And what this team needs to do, or this club needs to do, is it needs to hit the ground running at the beginning of next season.